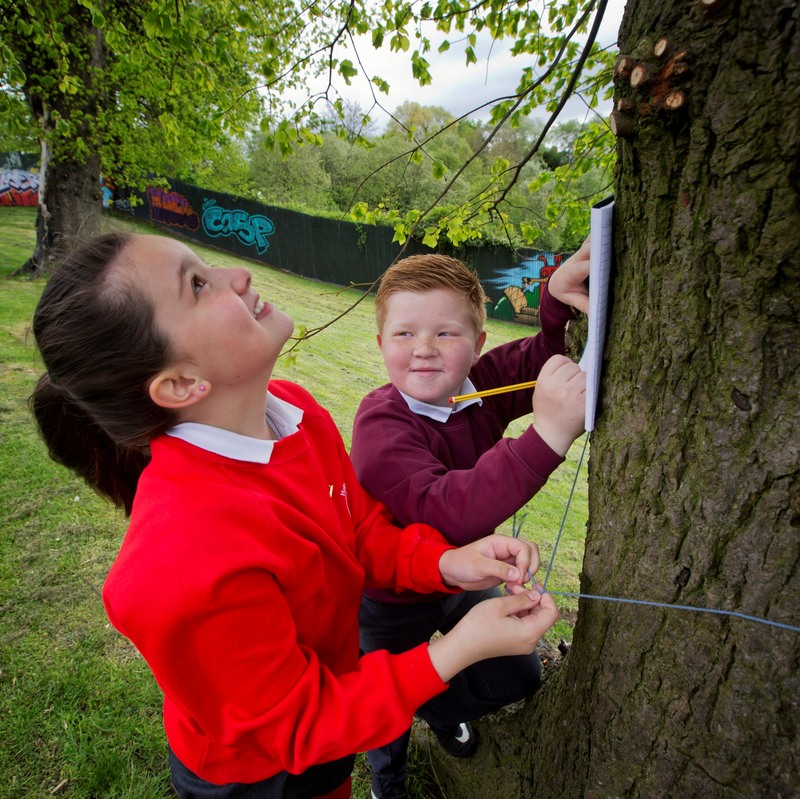 Forest School brings children together at a ‘peace wall’ gate. Children from schools in an interface area of north Belfast are transforming a peace wall gate with a grant from the Big Lottery Fund. Mary Patricia Craig and Kiane Dickson record the girth of a tree during a Forest School programme. Forest Schools use the natural environment to develop children’s skills and increase well being. Activities include scavenger hunts where the children have to find different colours or textures in the park, and learning about forest plants and animals. The course lasts 12 weeks and at the end of it three teachers will be certified Forest School leaders so they can carry on the work. Aideen Hickey, a teacher at Holy Family School, said the project had brought the children together: “The kids had thought of it as two parks. They didn’t realise it’s the same park but just divided by the wall. They were a little nervous at first, but now we’re in lesson four they all know each other and have become friends. 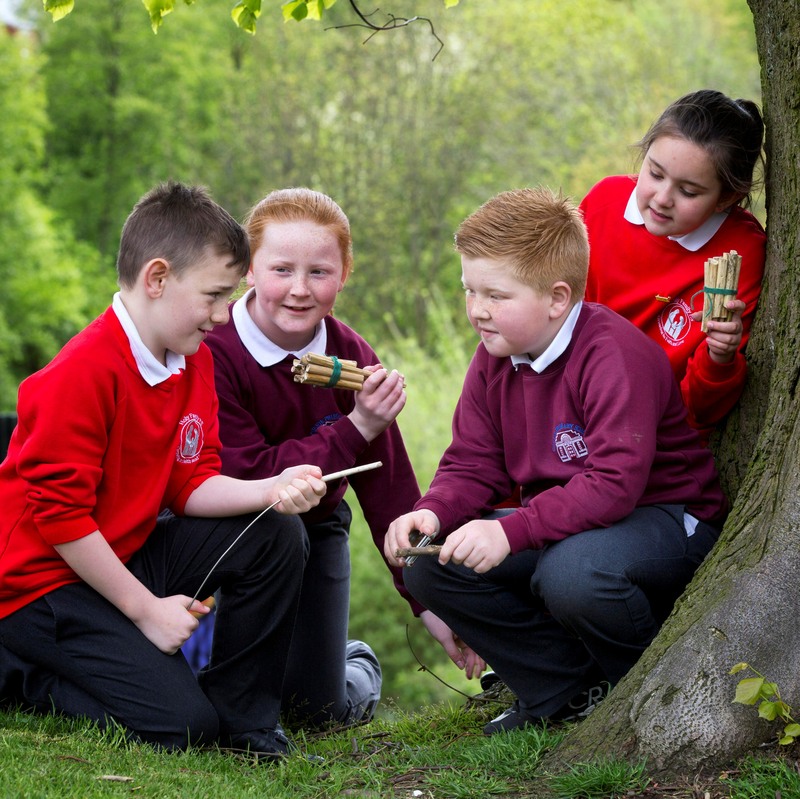 L-R Darragh mcCrory, Rayanna Johnston, Kiane Dickson and Mary Patricia Craig prepare sticks to make bug houses. Dessie Henderson (9) from Holy Family PS said he was already carrying the lessons from the Forest School home, and it has encouraged him and his brother to use the park more outside school too. “I come to this park to play sometimes and to do litter picking like we do here at the Forest School, but I go to the whole park now,” he said.